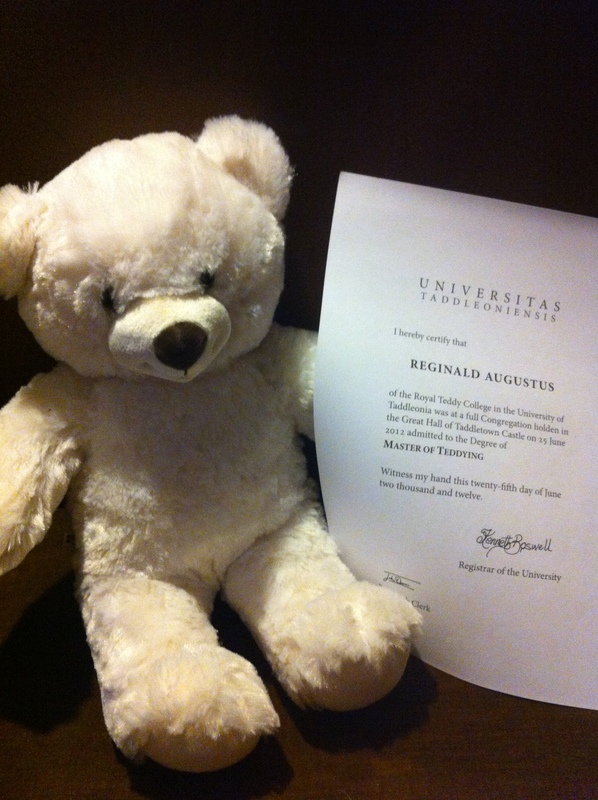 Pictured on the day of his graduation from Teddy College, Reginald Augustus shows off his degree certificate. Yesterday was the first day of the annual full Congregation of the University of Taddleonia; in other words it was graduation day. The ceremony, held as usual in the Great Hall of Taddletown Castle, started with a speech from Dr Monarch, the Vice Chancellor (and keeper of the University Clock) and then many hard-working students received their degrees from none other than the Chancellor of the University, King Taddle himself. This year, the first college to graduate was the Royal Teddy College, which is still the only college in the world where teddies can study the art of teddying to degree level. At the close of the ceremony, the Taddletown Brass Band played the University song followed by the National Anthem. Afterwards, there was a garden party where everyone enjoyed strawberries and cream. I’ve already got a role lined up. I start on Wednesday. It reminds me of my own graduation. This reporter is not ashamed to say that he wishes all the new graduates the best of luck in their new careers.